I had great ideas for this last slice of life for the March challenge, but the universe, it seems, is conspiring against me. Last night our internet went out right as I prepared to guest host #titletalk. Then a bat came out of hibernation, apparently, in our basement. So writing last night - not happening. Today I figured I'd just catch up at school and get a post written. But first day back, new student, and a back that decided to get worse, not better, led to the decision of a short post. We came back from spring break today with lots to catch up on. We're beginning podcasts this week and figuring out what that looks like for us. We talked about the Geisel award and Mr. Schu and Mr. Sharp's new challenge. We're deciding if we can participate and how that would work. Wrapping up the slice challenge, I met with over half of the class to look through the month of their writing and talk about how they have grown. By 2:15 I knew my students were spent, and so was I. Trying to move around the room, my back would send spasms up, threatening to bring me to my knees. Thinking what we could possibly do for the next twenty minutes before chorus, I remembered that today was the day of the month that Betsy celebrates Chalk-A-Bration. 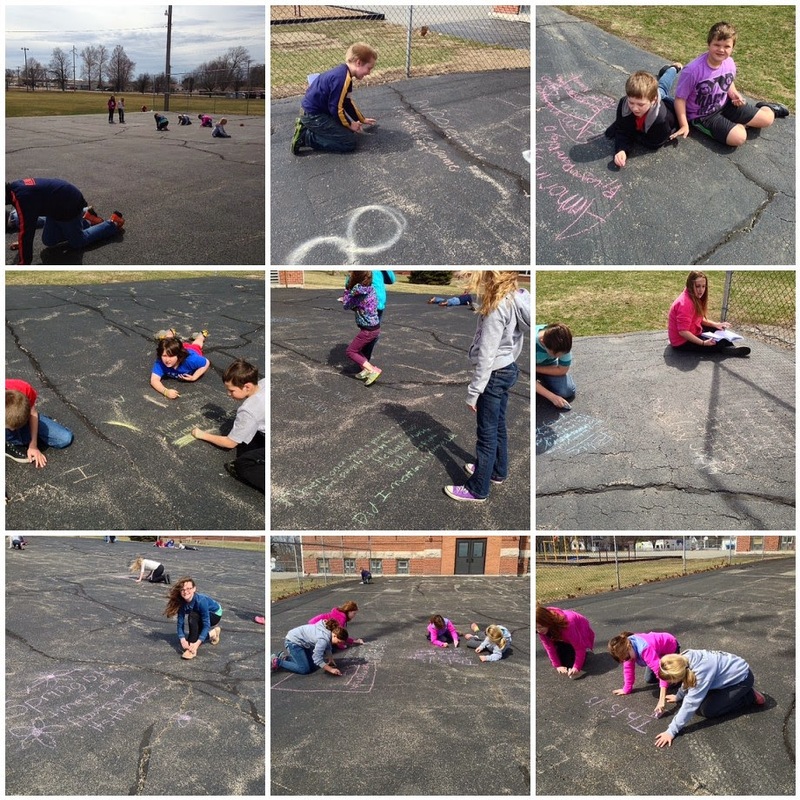 And what I love about my students is that I threw the concept out there - let's go write poems on the playground - and they grabbed it, chalk basket and all. All-in-all, a fabulous Monday. I’ve just finished Brené Brown’s amazing book, Daring Greatly. I think this will be a book I will need to reread many times before processing it all. 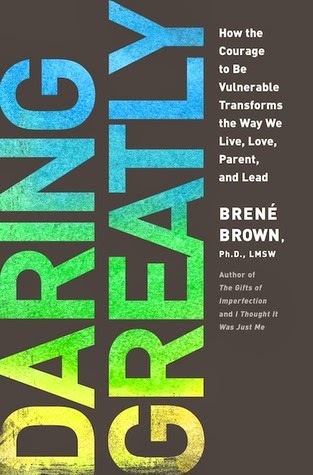 Brown writes about the issues we have with vulnerability, but that without vulnerability we cannot experience true joy. And that by being vulnerable we open up the doors to courage, engagement, and connection. There is so much I am taking away from this book, but this idea of vulnerability caught me first and made me think. To be vulnerable is scary. We only let the people we love see us for who we truly are, right? They are the ones that will love us unconditionally. I think this applies to our relationships at home, with our closest friends, and – to some extent – to our classrooms. Several years ago I heard Nancie Atwell speak about how well her students knew her. Because of that honesty she shared with them, they trusted her and shared back. Those relationships became closer in the classroom and built the backbone of her classroom community. I left that conference changed as a teacher. · Times I screwed up – when I lied in fourth grade to my teacher, when I didn’t stand up for a friend, my lack of effort in school, etc. What I’ve noticed is that the more I share of myself with my students, the more they share in return. As a collective group, we become closer. I know when I start getting emails, visits to the classroom before school, messages on Google Docs – all from various students looking for advice – I know I’m on to something here. A parent emailed the other day and told me her child called me her second mom and said she could talk to me about anything. She simply emailed me to thank me for that. It was the best thing I read that day because I knew I wasn’t imagining the gains we have made this year. It has been amazing. Some days it is hard to be vulnerable. Sharing my writing, sharing when I’ve messed up, when I’m frustrated - those things drain you. But, and this is big, I think my students know that. They know I trust them enough to ask for help. They know that I’m honest with them when I come in, say I’m having a really bad morning, and ask for someone to make me laugh – that I truly need them. At ten years old, it’s nice to be needed. So yes, being vulnerable is scary. Being open, honest, truthful with ten and eleven year old kids could come with risks. But I’ve found it to be the opposite of scary. My teaching has brought me the greatest joy since I decided all of those years ago to share myself. Sharing with my students causes them to share with me in return. And from that foundation, we grow together. For that reason alone, I’m so excited to go back to school tomorrow. I can’t wait to see what they’ve done over break. I know it will be a great day. I woke up this morning wondering how my students were doing with the Slice of Life challenge over break. As always, I have thoroughly enjoyed it, but look forward to a break come Tuesday. In writing I am feeling tugged in many directions. I need to write for myself – which often takes the form of this blog and my journal. I need to write for Choice Literacy – it has been several months since I wrote an article for them. I planned to get several done over break, but haven’t. I also need to get a couple pieces of writing done for various projects that friends are working on. Finally, I need to write more for myself about relationships in the classroom and see if there is any direction that I could take that could ultimately end up published. So, while I love the March challenge, I feel like my writing brain is going in a million directions and I’m just treading water. I think I will likely take a week off from blogging after the Slice Challenge and try to check some items off my to do list. Today and tomorrow are my last days of spring break. It has been a relaxed week spent mainly at home. I’d say I read a lot this week, wrote some, dreamed up ideas, and spent time with family. In other words, almost a perfect week. The main thing I didn’t check off was that I got little to no exercise in as I have been struggling with back issues. I’m hoping to turn that around next week. 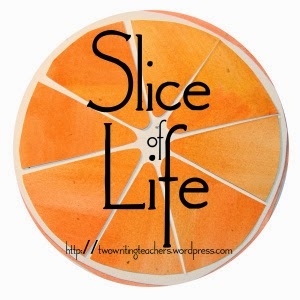 For my “slice” and my “celebrate this week” post, I chose to go with an Animoto video again. I do love them and hope you do too. Hope your week has been amazing! 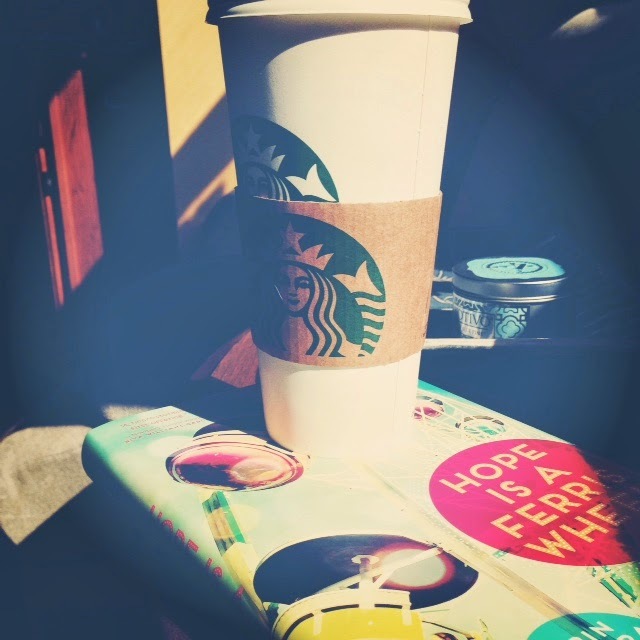 Longtime readers of this blog - and my students - know my obsession with Starbucks. We don't have one in our town. There are great things about small towns and others that aren't so great. You can get a Cafe Mocha at McDonalds, but it isn't the same. There are a couple of places in town that do sell them, but they aren't open when I'm going to work. And I do so love Starbucks. One of the best parts of break is that I can drive to Champaign, the closest Starbucks, any time I want. The hour drive round trip is completely worth it. One sip and, ahhhhh. The way that woman feels about plums, I feel about Starbucks. It tastes good to me. Now, off to get one. Is relaxing on Daufuskie Island. Listening to the waves crash on the shore. Feeling content in a way that I haven’t for so long. This year my island is far away. Saving money instead to travel to see “the Mouse” this summer. My break would be one at home. Students – friends of my son – standing in my kitchen. 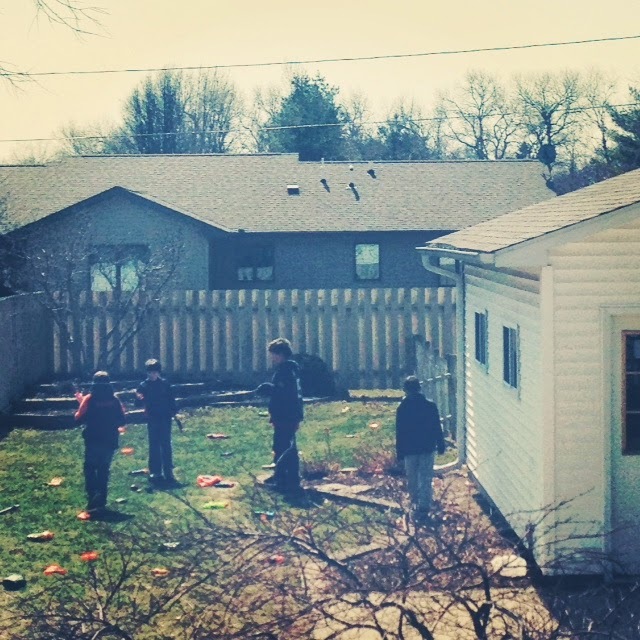 Nerf gun wars being waged outside the back door. Curled up in bed reading. And a quick trip to Chicago at week’s end. These boys are growing up. The other one only inches away at eight. The other addicted to YouTube. I watched them today spending time with Mumsie (my mom). Where did the years go already? Yet, there hasn’t been an age yet that I haven’t loved. Or even first years in school. But enjoy each new stage even more. Can that continue to go on? Can I keep having more and more fun as they get older? I love each year in the classroom. I love every student I get to spend time with. But nothing compares to this. Maybe time doesn’t need to slow down? I can’t wait to see where we are next. When I was in school, I didn’t have a strong desire to learn. Maybe in lower elementary. But by the time I hit upper elementary/ junior high, I just wanted to get my work done. My teachers were terrific, I just had somehow learned along the way that I needed to memorize facts, do well on tests, get decent grades. I wasn’t really invested in my own education and, I can say for certain, I did not do my best. Thinking back on that, I often wonder why. What could have made me turn around and actually be curious? To want to learn for myself? I’m not sure. Today I have a strong desire to learn. I feel like I’m on a constant treadmill, trying to stay caught up with an ever-growing stack of books, blogs, articles, and websites to learn from. I come across tweets and pause, wanting to know more. I know I will never be caught up, but enjoy the learning process. Two topics are currently at the forefront of my mind – podcasts and makerspace. I’ve thought about podcasts for some time. I’d love my students to run one. To share book reviews and their learning. To make it their own. I’m just not sure how to begin. As for makerspace, I just came across the term on Twitter the other night. Kristin Ziemke was talking about it and I immediately began looking into what it was. I’m not sure on an exact definition, but it seems like you are inviting students to create. In makerspace, like podcasting, the possibilities are endless. Here’s why I am interested in these topics – they harness the creative powers of our students. 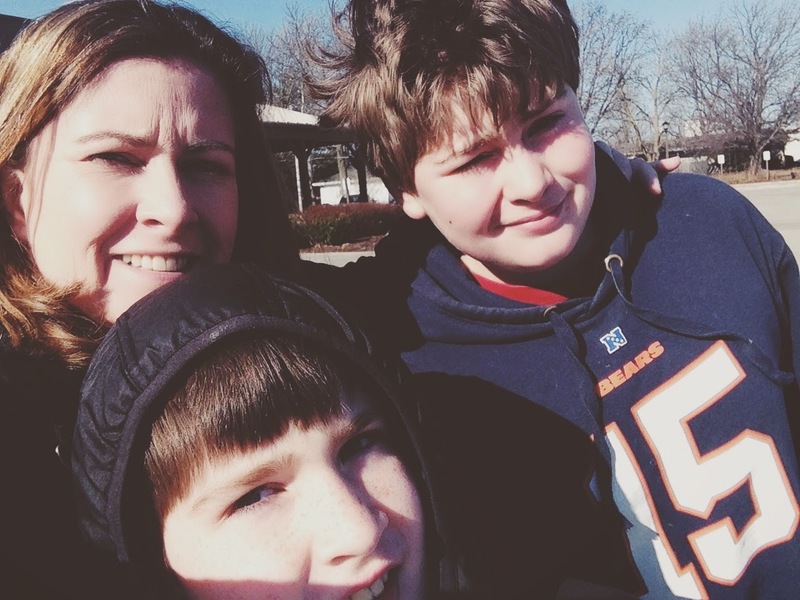 Right now I have four boys running around outside of my home as I type. They have a stockpile of Nerf weaponry in the middle of our backyard. It is the “cornucopia” from Hunger Games. They just dove on the pile, grabbed what they could, and now are traipsing through the yards of our neighbors as they go to war. My oldest just came in and did his millionth plea of the day for a Go-Pro camera for his birthday so he could wear it on his head and videotape their action scenes. They have spent hours creating their world. When he does take a video of a “war” with our old camera, he spends even more time scripting it out, editing it on iMovie, and then creating a video to upload to his YouTube channel. He is eleven and has taught this all to himself. I think our kids have this potential in them. We need the creators to keep that desire alive throughout their years at school. So I will continue to look into topics like podcasting and makerspace and see what I can learn and bring back to my classroom. And, if you have any advice, tips, or reading I should do, please include that below. Now, finally, I truly do love to learn. Slice of Life - What is Your Best Effort?